<h2>&#039;Evolution, not revolution&#039; will guide next EU research funding programme – Jean-Eric Paquet</h2><br /><p><strong>You previously worked in the team of Philippe Busquin when he was European Commissioner for Research (1999-2004). How has the research landscape changed in the meantime?</strong></p> <p>‘The overall context certainly has changed in the past 15 years. And what has changed is the challenges that our societies, our economies, the European Union is facing, such as climate change, where research and science are clearly holding part of the answer. The expectations of societies and the need for science to live up to these challenges is greater than ever.’</p> <p><strong>What do you see as the priorities going forward?</strong></p> <p>‘Carlos Moedas (the EU commissioner for research, science and innovation) has made a very strong push on <a href="https://horizon-magazine.eu/key-themes/open-science" target="_blank" rel="noopener noreferrer">open science</a>, <a href="https://horizon-magazine.eu/key-themes/open-innovation" target="_blank" rel="noopener noreferrer">open innovation</a> and <a href="https://horizon-magazine.eu/key-themes/open-world" target="_blank" rel="noopener noreferrer">open to the world</a>, which I think is a very ambitious research policy on which we are progressively delivering.</p> <p>‘On open science, a lot was done already, and Carlos asked <a href="https://horizon-magazine.eu/article/open-access-scientific-publications-must-become-reality-2020-robert-jan-smits_en.html" target="_blank" rel="noopener noreferrer">Robert-Jan</a> (Smits, the former director-general for research and innovation) to continue to work on access. That is a particularly important assignment he has.</p> <p>‘On open innovation (there are) ongoing discussions on the European Innovation Council (EIC) (and) on disruptive innovation. There is a lot which was done under <a href="https://ec.europa.eu/programmes/horizon2020/what-horizon-2020" target="_blank" rel="noopener noreferrer">Horizon 2020</a>, but the Commission is certainly very ambitious to do more. And this is, for me, a particularly interesting part of the mandate … because it really leads into a key discussion of how research results are then used.</p> <p>‘On open to the world, this is a particularly challenging area. Science is open by definition and I think flourishes on that. At the same time, we are in a complex international environment, probably more complex today than when this Commission started its work. There are a number of challenges.’<br /> <div class="quote-view quotesBlock quote_horizontal"> <div class="quotesTop"><img src="https://horizon-magazine.eu/sites/all/themes/horizon/images/quotes_top.png" alt="" title="" /></div> <p>'We need to pay a lot of attention to helping science, research, innovation results feed into market deployment. 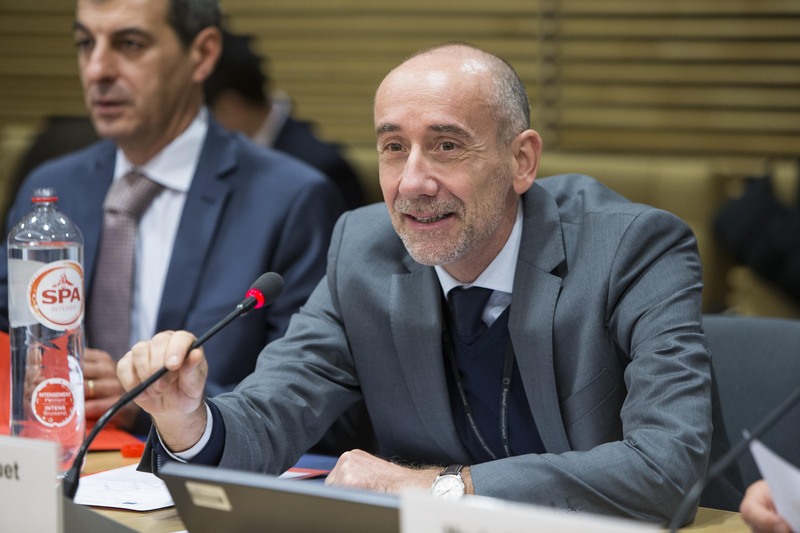 '</p> <blockquote><p>Jean-Eric Paquet, EU Director-General for Research and Innovation</p></blockquote> <div class="quotesBottom"><img src="https://horizon-magazine.eu/sites/all/themes/horizon/images/quotes_bottom.png" alt="" title="" /></div> </div> </p> <p><strong>What challenges in particular?</strong></p> <p>‘Our cooperation with key players. The world is in competition with China. Cooperation with Russia (may become) more complicated after the decisions which were taken at the European Council last week. We also have major challenges to continue to work with colleagues across the Atlantic. I think American science is a key partner for European science and rightly so – and we need to ensure our American colleagues can continue to engage.’</p> <p><strong>What can you tell us about the UK’s future involvement with EU research?</strong></p> <p>‘We have now the guidelines of the European Council which were agreed by leaders, which I think are quite explicit. We clearly envisage, in terms of socio-economic cooperation, to continue to have a solid relationship with the UK – also in research and science.’</p> <p><strong>You’re coming into the Directorate-General for Research and Innovation at a time when plans for the next EU funding programme are 80% complete. What information can you give us about what they contain?</strong></p> <p>‘The overall structure is clearly emerging and is largely based on the existing structure of Horizon 2020. We are largely basing the work on the report of <a href="https://horizon-magazine.eu/article/next-eu-science-fund-should-be-doubled-size-pascal-lamy_en.html" target="_blank" rel="noopener noreferrer">Pascal Lamy</a>, which mantra I find quite telling – which is “evolution not revolution”.</p> <p>‘We will have an extremely strong science pillar, largely based on the European Research Council, which is clearly one of the successes of the framework programme and European research more generally. Marie Curie (the Marie-Sklodowska Curie Actions) obviously continues, infrastructure (funding) continues. There is a very high European added-value in this science pillar of Horizon 2020 and of the future framework programme.</p> <p>‘And then there will certainly be around the open innovation part a very significant effort to improve our instruments to promote disruptive breakthrough innovations at EU level. Around this innovation pillar is of course the work on the European Innovation Council, which Carlos Moedas has been promoting now over the last year and a half. So the structure is not a surprise.’</p> <p><strong>What’s left to decide?</strong></p> <p>‘We now have two more months to fine tune and&nbsp;fine-tuning is going to be an important part of the process. A key element is going to be the overall amount of the budget. The three scenarios (we are working with) are 80 (billion euros), 120 (billion euros) or 160 (billion euros).</p> <p>‘If I listen to my president, Jean-Claude Juncker, his remarks in the Parliament a few days ago (were) rather encouraging. I am indeed impressed by the fact that the framework programme seems to be one of the obvious priorities.’</p> <p><strong>Outside of the next funding programme, what are some of the other things you’ll be looking at? </strong></p> <p>‘How we manage to ensure that around the framework programme, we can also better organise the broader innovation or industrial agenda of the Commission. The structural funds are an obvious key programme in this regard. I strongly believe that we need to support all EU Member States in developing their research systems and capacities. I am rather struck by the fact that after 15 years this is still so heterogeneous. We need to look into ways where the European structural funds can effectively complement the framework programme to help all Member States to build up their capacity.</p> <p>‘What is also for me as important, is to help project promoters (from) research (and) science link into project promoters in industries, in public or local authorities in Member States, and help them effectively use the synergies between these programmes.’</p> <p><strong>Apart from the big question of the next EU research budget, what challenges can you see?</strong></p> <p>‘We need to ensure we continue to support European science to remain top-class (in) worldwide science. We are at the top and that is where we need to stay. And it’s demographically challenged, but also challenged by a number of political choices made by our competitors which are putting science and research very high on the agenda.</p> <p>‘I also think that the European social model really depends heavily on our competitiveness, on our productivity, and I think we need also to pay a lot of attention to helping science, research, innovation results feed into market deployment. I think that the EIC will also be an extremely useful tool to work directly with economic actors at the level of start-ups and especially scale-ups.’</p> <p><strong>Are you looking forward to getting stuck in?</strong></p> <p>‘I am absolutely delighted to take up this portfolio. It’s a fantastic portfolio. For me it’s looking into the future, working for scientists, working with industry but working ultimately for citizens and our society.</p> <p>‘I think we are doing amazing stuff. I discovered that we funded a project which has produced solar jet fuel, kerosene, from water and CO2. I mean this is … completely amazing. Whether this can reach industrial scale I have no idea, but I think the notion that EU research is (something) which captures the imagination (is) very important.’</p> <p><em>If you liked this article, please consider sharing it on social media.</em></p> <p><a href="http://bit.ly/newsalertsignup" target="_blank" rel="noopener noreferrer"><em><img class="" src="https://horizon-magazine.eu/sites/default/files/news-alert-final.jpg" alt="" width="983" height="222" /></em></a></p> <br /> <img src=”http://www.google-analytics.com/collect?v=1&tid=UA-40077089-1&cid=evolution-not-revolution-will-guide-next-eu-research-funding-programme-–-jean-eric-paquet&t=event&ec=republish&ea=read&el=evolution-not-revolution-will-guide-next-eu-research-funding-programme-–-jean-eric-paquet&cs=republish&cm=republish&cn=republish&cm1=1" /> This post <a href="https://horizon-magazine.eu/article/evolution-not-revolution-will-guide-next-eu-research-funding-programme-jean-eric-paquet_en">&#039;Evolution, not revolution&#039; will guide next EU research funding programme – Jean-Eric Paquet</a> was originally published on <a href="https://horizon-magazine.eu/">Horizon: the EU Research &amp; Innovation magazine | European Commission</a>. The structure of the EU’s next research funding programme is based on the mantra of ‘evolution, not revolution’ and so will not contain any major surprises, according to Jean-Eric Paquet, the EU’s recently appointed director-general for research and innovation, who takes up his new role on 3 April. You previously worked in the team of Philippe Busquin when he was European Commissioner for Research (1999-2004). How has the research landscape changed in the meantime? What do you see as the priorities going forward? ‘Carlos Moedas (the EU commissioner for research, science and innovation) has made a very strong push on open science, open innovation and open to the world, which I think is a very ambitious research policy on which we are progressively delivering. ‘On open science, a lot was done already, and Carlos asked Robert-Jan (Smits, the former director-general for research and innovation) to continue to work on access. That is a particularly important assignment he has. ‘On open innovation (there are) ongoing discussions on the European Innovation Council (EIC) (and) on disruptive innovation. There is a lot which was done under Horizon 2020, but the Commission is certainly very ambitious to do more. And this is, for me, a particularly interesting part of the mandate … because it really leads into a key discussion of how research results are then used. What can you tell us about the UK’s future involvement with EU research? You’re coming into the Directorate-General for Research and Innovation at a time when plans for the next EU funding programme are 80% complete. What information can you give us about what they contain? ‘The overall structure is clearly emerging and is largely based on the existing structure of Horizon 2020. We are largely basing the work on the report of Pascal Lamy, which mantra I find quite telling – which is “evolution not revolution”. ‘We will have an extremely strong science pillar, largely based on the European Research Council, which is clearly one of the successes of the framework programme and European research more generally. Marie Curie (the Marie-Sklodowska Curie Actions) obviously continues, infrastructure (funding) continues. There is a very high European added-value in this science pillar of Horizon 2020 and of the future framework programme. ‘We now have two more months to fine tune and fine-tuning is going to be an important part of the process. A key element is going to be the overall amount of the budget. The three scenarios (we are working with) are 80 (billion euros), 120 (billion euros) or 160 (billion euros). Outside of the next funding programme, what are some of the other things you’ll be looking at? ‘How we manage to ensure that around the framework programme, we can also better organise the broader innovation or industrial agenda of the Commission. The structural funds are an obvious key programme in this regard. I strongly believe that we need to support all EU Member States in developing their research systems and capacities. I am rather struck by the fact that after 15 years this is still so heterogeneous. We need to look into ways where the European structural funds can effectively complement the framework programme to help all Member States to build up their capacity. Apart from the big question of the next EU research budget, what challenges can you see? ‘We need to ensure we continue to support European science to remain top-class (in) worldwide science. We are at the top and that is where we need to stay. And it’s demographically challenged, but also challenged by a number of political choices made by our competitors which are putting science and research very high on the agenda. Are you looking forward to getting stuck in? ‘I am absolutely delighted to take up this portfolio. It’s a fantastic portfolio. For me it’s looking into the future, working for scientists, working with industry but working ultimately for citizens and our society.